The Doris project bag was designed with yarn projects in mind but it could be equally useful as a baby changing bag or casual everyday bag. This PDF pattern contains the step-by-step instructions to make the simple drawstring bag and all the additional elements that you can pick and choose from to include in your own version. There are lots of photographs so this pattern should be suitable for confident beginners as well as those with more advanced sewing skills. The Doris project bag is fullly lined and closes with a drawstring. The bottom section of the bag is lightly structured so that it can be free-standing and the top section of the bag is less structured so that it can fold back over itself to allow easy access to the contents of the bag. This versatile design offers many options for personalisation including an open pocket, a zipped pocket, removable carry strap and elasticated fabric loop. You are buying a downloadble PDF pattern. This item will automatically become available for downloading as soon as you complete your purchase. 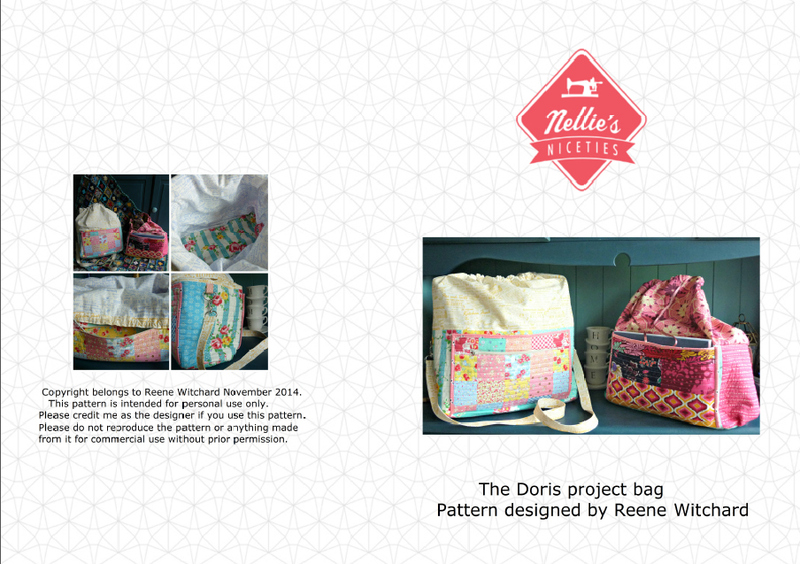 We'd love to see your version of our Doris project bag design so please do send us a photo or use the hashtags #nelliesniceties and #dorisprojectbag on Instagram.